A woman's leg has swelled to enormous proportions in a potentially-deadly condition. 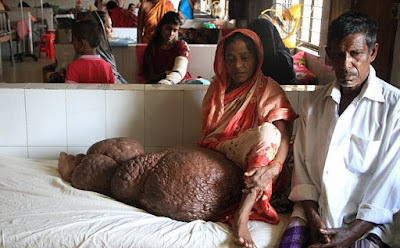 Rezia Begum's, 40, right leg weighs around 132lbs (60kg) due to suspected elephantiasis. The mother-of-two, from Bangladesh, has suffered with the condition ever since the birth of her second daughter 18 years ago. Although it is unclear how Ms Begum's condition affects her, she says she is now dependent on the support of her relatives. Although she is being cared for at Dhaka Medical College Hospital in Bangladesh, she is yet to begin treatment. Surgery and additional tests are required before therapy can start. The cause of Ms Begum's condition is unclear, however, previous reports of other cases revealed the disorder can be caused by roundworms entering the body via mosquitoes. If the swelling spreads from the legs to the abdomen, the condition can be fatal. 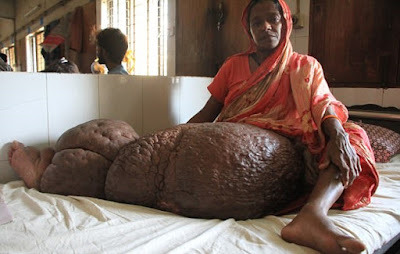 Elephantiasis affects around 120 million people globally. It is characterised by the massive enlargement of an area of the body due to obstruction of the lymphatic system. This results in the accumulation of fluids in the affected part of the body. » Boko Haram Reveals To Give Back The Girls, But On ONE CONDITION! SEE WHAT THAT CONDITION IS!